I recently took a two day trip to Sydney. The occasion? Oh, you know. Just to go and see the Domestic Goddess herself, Nigella Lawson speak live at Sydney Opera House! I stayed with two of my best friends Tom and Anthony, who happen to live in a centrally-located apartment in Pyrmont, overlooking the Star Casino and with gorgeous views of the city skyline including the iconic Sydney Harbour Bridge. What a lucky girl I am! While I was in Sydney I took the opportunity to check out some local cafes and restaurants. A couple were recommended by friends and others had been on my list to try for some time. 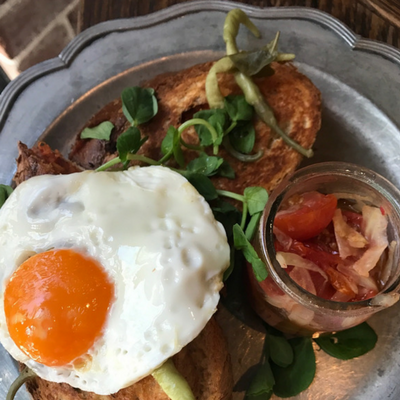 Whether you're heading to Sydney for a weekend or a week, here are some of my favourite food experiences of my trip which I hope will help you next time you're planning a getaway in Sydney. A coffee and bakery empire set amongst a sprawling urban oasis. The Grounds of Alexandria is a coffee roastery, café, sustainable garden, function centre and bar, all set on what was once an industrial carpark but is now a delightful Garden of Eden for food and coffee lovers alike. Everywhere you look is something of beauty; the whole place is just an Instagram photo waiting to happen. The entire plot is carved up into a series of smaller garden rooms that give the impression that the garden just goes on and on forever. It feels reminiscent of an English style garden, rambling yet clearly well-planned. There are three different spots to eat at The Grounds, The Café, The Potting Shed and The Garden. We opted to sit in The Café and enjoy the morning buzz at the heart of the action. We arrived around 9am on a Monday morning, which turned out to be a great time to visit; after the pre-work rush and before the yoga mums and hipster executives cruised in for their morning coffee. The menu at The Grounds features seasonal produce with as much of it grown on site as possible. I opted for ‘The Healthy Brekkie Bowl’ featuring black rice, poached egg, native greens, kale, asparagus, avocado and other healthy stuff. It was bloody delicious and I was sad when it was all gone! I have to admit I also had serious food envy when my mate Krissy’s meal came out - she had the Organic Salami and Three Cheese Toasty served with homemade cherry tomato chutney. It was quite possibly the yummiest take on a toasted sandwich I have ever tasted (yes, she shared with me, what a darl!). There are so many little nooks and crannies to explore at The Grounds and after we finished breakfast we wandered around exploring for about an hour, watching the massive team of pastry chefs creating in the kitchen, admiring the cooking demonstration kitchen, cooing over the funky bathrooms where even the hand wash is branded, watching the coffee roaster dudes doing the morning roast and visiting the resident pig Kevin Bacon at his sty! As we were leaving I couldn’t resist a cold drink from the lemonade stall and opted for a Rose Lemonade which was a traditional lemonade infused with rose petals and served with lashings of fresh mint. I have to find a way to recreate that flavour, it was truly unique and so refreshing! The Grounds of Alexandria is a really special place and the owners have created something that I feel is very unique in a place that was historically very industrial. It is a perfect slice of green heaven hidden behind big brick walls and a welcome haven away from the chaos of inner city Sydney. If you love coffee, pastry, gardens, fresh produce, or just being surrounded by beauty, you are going to go nuts at The Grounds. It’s like Disneyland for foodies, and is a very magical experience. Make sure you allow at least two hours so you have time to fully explore the whole place, as there's heaps more that I haven't even mentioned! Seriously, just go there. Don't forget to charge your phone beforehand for all those Insta pics! China Lane is tucked away in Angel Place, behind Sydney Recital Hall. You’ll know it when you reach it. The alleyway is decorated with hundreds of bird cages suspended from the ceiling accompanied by amplified recordings of birdsong. I thought this was part of the restaurant and thought it a bit disjointed from the interior. I found out later that this is the ‘Forgotten Songs’ installation, commissioned by City Art Sydney and designed to evoke the song of 50 different bird species which once inhabited central Sydney but are sadly no more. We opted to sit inside as I found the idea of listening to ghost birds a little unnerving and eerie, but the installation itself is definitely very stirring and worth a look when you’re in the area. The interior of the restaurant is sophisticated and warm, the lighting dimmed. There is an air of 1960’s China, owing to the retro paintings, accents of black and timber paneling on the walls. The addition of Scandinavian-designed chairs is random yet somewhat perfect. Contrary to what the name suggests, China Lane is not a Chinese Restaurant, strictly speaking. It is modern Asian fusion at its best; somehow managing to merge Chinese, Vietnamese, Japanese and other cuisines seamlessly and with creative flair. These were our favourites but in truth we could not fault much with what we ordered, including the Chocolate and Ginger Mousse with peanut butter ice cream, honeycomb and mandarin. I normally avoid desserts at Asian restaurants but this menu piqued my interest and we weren’t disappointed. Re-development of Barangaroo is ongoing, with the new casino yet to be built. That said, the waterfront dining precinct is already well-established and a unique spot for a meal or drink at any time of day. Barangaroo offers dining options for all styles and budgets; everything from street food to fine dining. Celebrity chef and owner of iconic Sydney restaurant Aria Matt Moran has opened his newest project Barrangaroo House, a three level bar and restaurant combo, offering different experiences on each floor. Owing to my obsession with European style deli cafes, my city guides Anthony and Tom took me to Bel & Brio, a boutique wine bar, providore, cellar and gourmet food store. You can buy pretty much anything at Bel & Brio and it almost seems to have a split personality – parts of it feel like you’re at your local IGA - and others take you straight back to foreign countries as you peruse the artfully-decorated chocolate displays and ogle at flagons of 100 year old balsamic vinegar stored in locked cabinets like diamond rings. 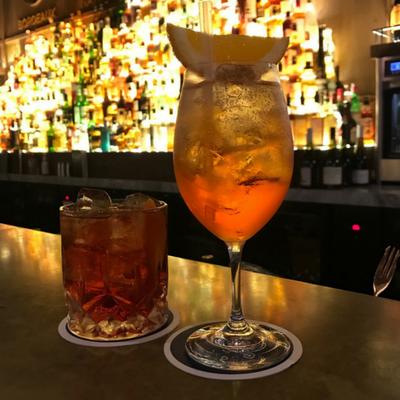 If you make it to Bel & Brio, I recommend checking out the wine bar; it is well worth a look with its extensive (read: massive) drinks list and extremely polite, proficient bar team. I’ll be back for another Aperol Spritz for sure. Having once lived in Sydney, it was really great to visit Barangaroo if only to see Sydney Harbour from a completely different angle as this part of the harbour – once a shipping container yard – was previously disused. When staying on or near Sydney Harbour, ferry is definitely one of the most unique and enjoyable ways to get around other than walking. It’s affordable, efficient and you’ll get treated to some of the best views of Sydney Harbour, especially at night. You’re more likely to get a seat and it’s not as chaotic as catching the train and way cheaper and faster than a cab! Winning all round!